Download the Windows LinuxLive USB creator utility here. Start the Lili USB creator utility. 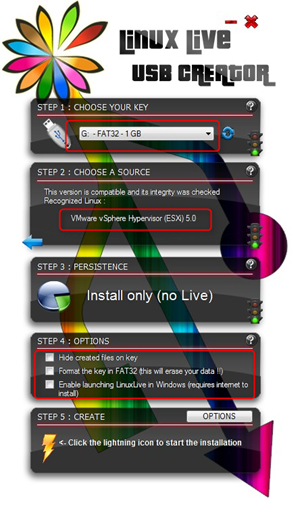 Follow the steps 1,2,4 and click 5 to create the USB stick. Wait till the USB creation process is finished. So now you have a bootable ESXi stick. You can stop here if you you want to install ESXi with manual installation steps. vim-cmd hostsvc/datastore/rename datastore1 "$(hostname -s)-local-storage-1"
For editing and creating the boot.cfg and ks.cfg file in Windows I use Notepad++ so NO hidden carriage returns are in the files. And the USB stick creation in ready. 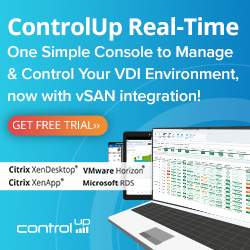 An easy way to test the ESXi 5 USB stick and the scripted installation is using VMware Workstation. See my post “Boot from USB in VMware Workstation” found here. William Lam’s blog has real good information about Kickstart scripts found here. Thank you for the article. It works fine. If you’re evaluating at home, another option is to use VMware player with USB redirection and the ESXi 5 ISO. Create a new virtual machine with a 4 GB HD or smaller. Boot the virtual machine and install ESXi to the USB drive. During the process you get some errors about supported hardware, these can be ignored. When it’s finished you can remove the USB drive and boot you’re system from this drive. Configure the management network and you should be ready to go. I used this method to upgrade my ESX4 system. All I had to do afterwards is import the guests. Thanks for the instruction they are perfect but when i run the newly created esxi 5.0 usb stick i get an error which states the following. i am selecting the interactive installation method from the esxi menu. neither the install nor the upgrade userchoice was not set. after i see this error the system reboots and makes the attempt again to install. @Held: I’m also having the issue with “neither the install nor the upgrade userchoice was not set”. I verified that boot.cfg was modified with “ks=usb”. First I tried the Scripted setup, didn’t work, froze after a while. Then I remade the USB-stick (1GB) and didn’t make any changes to the boot.cfg or ks.cfg and went for a Interactive Installation. What is this buffer and how can I fix it? Mike – I got this error but on a different file. tried a different usb (2GB) and worked now i am getting the Neither the install nor the upgrade userchoice was set…. Any ideas? I got this to work as an interactive install by skipping the ks=usb item, and adding -p 1 to the APPEND line in the syslinux.cfg. This is what the ESXi instructions said to do. The first run I did get an error loading s.v00 or something, but then I rebooted and it worked. I also had to do what Eris says. ks=usb didn’t work for me (gave me message that install/upgrade userchoice wasn’t set), so I removed that and added “-p 1” to the end of the APPEND line after the -c boot.cfg. This allowed it to install perfectly fine. Thanks for the Lili USB creator tip. Worked great. please could you explain what is these .b00 files? i cannot find anywhere documented these a.b00, b.b00, etc, and this is so confused to me. This worked great for me first try! Thanks for the information.